A female guest at the 1886 Crescent Hotel & Spa in Eureka Springs, Arkansas, awoke one night to the vision of a young girl standing next to the bed. Knowing her own daughter was not along on the trip, the woman noticed the child was wearing an old-fashioned petticoat and holding a small rag doll. After several minutes, the girl vanished. A few months later, the guest and her family returned. Upon entering the hotel elevator, she noticed an antique photo of a group on the steps of the resort. There in the photograph was the girl who had visited her in the night. Fran Carter has worked at the Radisson Lord Baltimore Hotel in Baltimore, Maryland for nearly a decade. One night, while preparing a small meeting room on the nineteenth floor, she caught sight of a little girl wearing a long, cream colored-dress and shiny, black shoes and bouncing a red ball. As the girl passed by the doorway, Fran ran to ask if she was lost. The little girl had vanished, but as Fran turned, she saw an older couple dressed in formal attire. Assuming they were the child’s grandparents, Fran turned to point where she had seen the girl. When she turned back to them, they too had vanished. Several years later, a hotel guest told Fran that she had been awakened in the night to the sound of a child crying. Sitting up in bed, she saw a little girl crying and rocking back and forth in the window. She was wearing a long, cream-colored dress and black shoes. The resident ghost at The Sainte Claire in San Jose, California, is Julia, the spirit of a prominent young woman who was to be married in the hotel’s Palm Room in the early 1930s. Tragically, Julia was abandoned at the altar by her fiancé and took her own life in the hotel’s basement. Today, hotel workers claim to feel Julia’s eerie presence in hotel offices where they often find files and papers mysteriously rearranged. Guests sometimes report hearing a woman’s high heeled footsteps clacking against a hardwood floor, despite the fact that the hotel’s floors are all carpeted. One guest taking photographs near the Palm Room fireplace, reported that his pictures contained a bride’s feet and the train of a wedding gown in the background. The Grande Colonial Hotel in La Jolla, California, has been part of the local landscape since 1913 and a retreat for Hollywood celebrities performing at the nearby La Jolla Playhouse. One room in particular was favored for discreet liaisons, thanks to its semi-private entrance. It seems the secretive spirits linger on as the front desk often receives calls from the room, only to find no one on the line. Upon checking the room, one employee saw a figure hiding behind the curtains. As he approached, the curtains fell flat, with no breeze or window to account for the movement. Napa Valley is a region renowned for its wine. It seems only fitting that any otherworldly apparitions would appreciate it as well. A recent guest in room 201 at the Napa River Inn in Napa, California, called the front desk to complain that strange noises and “white blobs in the mirror” were preventing her from getting to sleep. Seeking some relaxation, she opened a bottle of wine and poured a glass. When she turned to lift the glass, the wine had been drained from it. Passing it off to absentmindedness, she poured a second glass and carried it into the bathroom. She set it aside and stepped into the shower. Upon emerging, the glass had once again been emptied, although the guest insisted she had not taken a sip. When The Stanley Hotel in Estes Park, Colorado, opened in 1909, founder F.O. Stanley marked the occasion by presenting his wife Flora with a Steinway grand piano. Since that time, the hotel has had a long tradition of bringing great music to the Rockies. In the early 1980s, the hotel’s night manager was on duty during an electrical storm. The lobby was deserted on the dark and stormy night, but he was sure he could hear the strains of music. Taking a walk through the lobby, he noticed that the lights were on in the Music Room. As he approached the doorway, he could clearly see the piano keys moving, filling the room with music. Once he crossed the threshold, the music abruptly stopped. Located in the colorful, historic city of New Orleans, Hotel Monteleone is a natural home for wayward souls. Phyllis Paulsen, a guest at the hotel, was visited one morning by a three-year old boy wearing a striped shirt who emerged from her sitting room on the 14th floor. Paulsen says, “one moment he was there and the next he was gone.” When Ms. Paulsen went to check, the door was securely closed. This story of the young boy is consistent with many others from guests. Legend has it that he is the son of Josephine and Jacques Begere who stayed at the hotel in the late 1800s. Their son Maurice was left with his nanny while his parents went to the opera. When returning to the hotel, the horses were startled, sending Jacques from the buggy and killing him. It is said that Josephine died within a year of a broken heart. Some believe little Maurice roams the hotel in search of his parents who stayed on the 14th floor. There always seems to be a presence in room 413 at the Admiral Fell Inn in Baltimore. Some say a man died in the room but the story is vague. Housekeepers often talk about a strange feeling they get when cleaning the room. One housekeeper in particular, Frances Gale, used to clean 413 almost daily. She says she would always get a chill when in the room. Many times, she would feel a slight breeze against her face or arms, like when someone walks close by. On some occasions, she has had the sensation of someone placing a hand on her shoulder. New York City’s Algonquin Hotel was home to the famed “Vicious Circle,” a group of celebrated wits, including Dorothy Parker and Robert Benchley. The clique met daily for lunch at the hotel and it appears at least one of them may have stayed on. The hotel recently renovated an attic space into a small room, which seemed to displease the hotel’s spirits. There were many strange noises in the room the night it was completed. Around 3 a.m., the picture of Dorothy Parker fell off the wall and shattered. Green Room Grace is a playful spirit said to inhabit the General Morgan Inn in Greeneville, Tennessee. Grace, a former waitress in the Grand Central Hotel (predecessor to the General Morgan Inn) seems to have developed a fascination with spoons in the afterlife. For more than 75 years, there have been repeated reports of spoons disappearing from the Green Room, the hotel’s restaurant. Never a fork or knife – always just a spoon. Despite diligent sleuthing, none of the missing utensils ever turned up. Local legend “Boots” Berry was born in 1840 in room 302 of the Green Mountain Inn in Stowe, Vermont, the son of the inn’s horseman and a chambermaid. Boots followed in his father’s footsteps, caring for the horses and outfitting them for the stagecoach. One day, the stagecoach team bolted and Boots bravely risked life and limb to stop the runaways. He was dubbed a hero, and there wasn’t a place in the county where he could pay for his own drinks. Sadly, he descended into drunkenness, lost his job and wandered aimlessly, eventually landing in jail in New Orleans where he learned to tap dance from a fellow inmate. Boots eventually drifted back to Stowe, where a devastating blizzard hit the area. A small girl was somehow stranded in the snow on the inn’s roof. Boots recalled a secret passage from his own childhood and managed to safely rescue the child. Sadly, Boots himself slipped and fell to his death below. He had been standing on the roof atop room 302, his very birthplace. The inn has had reports from guests who have heard the sound of tap dancing on the third floor on stormy days. A guest at Brick House Tavern, one of Colonial Williamsburg’s Colonial Houses in Virginia, was awakened one night to the loud tramping of boots across the floor in the adjacent room. The boots proceeded into the guest’s own room—despite the fact there was no door and the floor was carpeted. The steps continued out the door, down the stairs and out the tavern’s front door. The story was told to a housekeeper who related that while cleaning the very same room, she had glimpsed a man in an old-fashioned, puffy-sleeved white shirt. No guests were checked into that room. Many nights the night auditors at The Blennerhassett in Parkersburg, West Virginia, would report hearing a loud sequence of knocks around 4:00 a.m. When they checked the security monitor that covered the area, no one was there. “The 4 o’clock Knocker” has also been reported at guest room doors, but when the door is opened, no one is in sight. 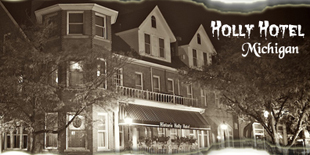 This haunted hotel in Ohio led our Haunted Hotels issue. Check them out for out of sight fright nights.